In my life of caregiving, I have learned two absolute truths. 1) That my love, my will and my intellect cannot cure the effects of ageing or disability in the people I love and 2) that caregiving is a job to be shared. It cannot and should not be done alone, if it is to be done well over the long term. Over the years, I have spent a great deal of time trying to get help in my home. I've advocated to representatives of government, asked my family and friends to take my healthy child for the weekend, or to walk the dog. I've even traded English lessons for occupational therapy services when a young Brazilian intern arrived on a study tour at our local children's treatment center. I've always known that I couldn't provide all the care my family needed by myself. So, when my friend and colleague Vickie Cammack first uttered the words "care networking", I stopped and listened, rolling possibilities around in my head. I know about social networking - I have two facebook accounts, a twitter handle, a blog, a website and lots of email. But, social networking? Vickie Cammack is the co-founder of Planned Lifetime Advocacy Networks (PLAN) and an expert in building real-time personal support networks for vulnerable people at risk of social isolation. Vickie used her experience in using the coordinated support of real friends to help at-risk loved ones to create TYZE Personal Networks, a secure web-based care coordination tool. The unique aspect of Tyze is that professional support workers can keep in touch with family and friends about the care and support of someone with care needs. But, the idea of care networking goes further than the PLAN or TYZE models - it refers to a fundamental shift in the way we think about care and give care in our society. It's an open and free flowing idea that challenges us to think about how to share care easily, naturally and on multiple platforms. It assumes that there are people who want to help caregivers in their task and that those people need a way to stay in touch about changing needs. The concept of care networking is not diagnosis specific or age specific. Care networking is an idea that encompasses young mothers, homeless people, grandmothers, people in hospital and someone with a sprained wrist. In short, it is a concept that works for EVERYONE. How will we get care networking embedded in our society? By talking about it! Please share this post if you support this concept. 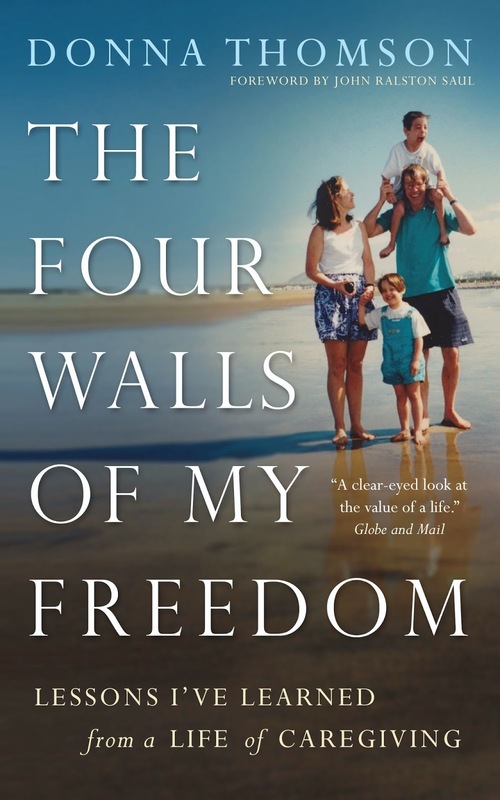 "The Four Walls of My Freedom: Lessons I've Learned in a Life of Caregiving" by Donna Thomson (House of Anansi Press, 2014) is now available in Canada at all booksellers. Available in the US at online booksellers in March, 2014.